Researchers at Kanazawa University have uncovered the role of lipids in facilitating a functional switch between two forms of a cellular enzyme: Peroxiredoxin (Prxs). Their study published in the Journal of Molecular Biology explains how negatively charged membrane lipids can bind to Prxs, and induce structural changes, in turn flipping their function. Prxs are a family of proteins found in abundance within red blood cells. The most common form of these, is 2-Cys Prxs. Until recently, the primary function of 2-Cys Prxs was thought to be its involvement in neutralizing free radicals, such as hydrogen peroxide (H2O2) which are harmful by-products of chemical reactions in the cell. Prxs have “active sites” on their surface, which can bind to free radicals and deactivate them. A more ambiguous role of 2-Cys Prxs is that of a chaperone; essential in maintaining the structural composition of other proteins, especially under conditions of stress. To undertake this role, 2-Cys Prxs must be in arranged as high-molecular-weight complexes (HMW). In the native form, it is dimeric in structure. The only known inducers of HMWs, are a docking of the energy carrier ATP/ADP onto the dimer, or overoxidation, a chemical reaction in which the active site is blocked. The exact roles of these inducers are however, debatable. Takamitsu Haruyama and colleagues conducted a groundbreaking study on the process that causes 2-Cys Prxs to switch into chaperones, which until now was quite elusive. The research team first grew the human form of 2-Cys Prxs, in bacteria, and isolated it. To then induce HMWs, it was incubated with Mg-ATP or Mg-ADP, their stable counterparts. Overoxidation was used as an alternative inducer. To their surprise, yields of HMWs were quite low. 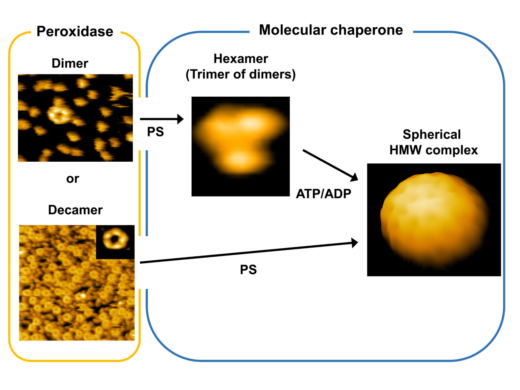 The structure of the resulting HMWs was examined using atomic force microscopy (AFM), a sophisticated technique used to magnify the structure of macromolecules. AFM suggested that HMWs consisted of a big sphere, which upon dismantling, revealed various shapes: a small hexagonal lattice, flattened sheets, and even smaller trefoil or clover-shaped particles. The team now had reason to believe that their isolated 2-Cys Prxs, was contaminated with something from the host bacteria, which lowered their yields, and formed spherical vesicles. This contamination was most likely to be another set of cellular macromolecules – lipids. 2-Cys Prxs was subsequently isolated with utmost care, ensuring it was free of all lipids. In a serendipitous discovery, the team now noticed that Mg-ADP or overoxidation no longer induced HMWs. Could it be the lipids then, that led to formation of HMWs? Four different membrane lipids were now incubated with 2-Cys Prxs. Two of these, phosphotidylglycerol (PG) and phosphotidylserine (PS) did indeed result in HMWs formation. This too had a nearly identical spherical structure, containing trefoil-shaped particles, most likely oligomers of 2-Cys Prxs. To assess functionality of the newly formed HMWs, their chaperone activity was tested on an artificially distressed protein. Indeed, only chaperone activity and no inherent peroxidase activity was seen. The authors speculate the exact chaperone function of the HMWs in the context of stress. They hypothesize that this complex might play a role in capturing and removing incorrectly structured proteins from the cell, which would otherwise cause more damage. Although this hypothesis needs further validation, their discovery of the specific lipids involved in this mechanism, will make it much easier. Given the need for chaperones in combatting aging, neurodegenerative diseases and cancer, these findings could have an impact on therapeutic research. A summary of the different structures of 2-Cys Prxs, their corresponding function, and the compounds inducing a structural shift in the protein.